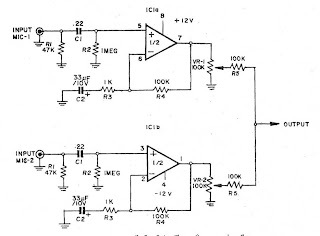 This be Pre Mic circuit or Microphone preamplifier circuit model 2 CH. 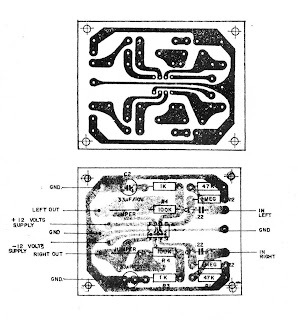 By this circuit uses integrated number circuit NE5532 or LF353. It perform enlarge sound signal from Dynamic Micro phone give the power goes up for subsequently submit to go to still stereo power amplifier circuit next. This circuit be of good quality good sound, because of use the integrated circuit decreases the noise, but should use the fire feeds +12V GND -12V with. The VR1 and VR2 perform fine decorate the sound. The detail is other and PCB see in a picture below.